Yarn - 2 skeins Knit Picks Main Line (Dusty Lavender pictured) or 160 yds of any aran/worsted weight yarn. Size - One size fits most. 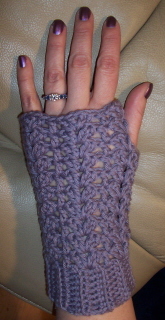 However, you can make the mitts smaller by crocheting 4 fewer rows on the wrist ribbing. (4 rows = 2 rows of rib = 1 shell and 1 dc.) You can size them up by adding 4 rows of sc on the wrist ribbing , thereby adding 2 rows of rib, one shell and 1 dc in the body of the mitts. You'll need to adjust your shell/dc count accordingly in the body of the pattern. Pattern stitches used - Beginning shell = Ch3, dc, ch1 , 2 dc in same space. Shell - 2 dc, ch1, 2 dc in same space. Gauge - 3 shells/3 dc (in pattern) = 4" 7 rows of shells = 4"
Finished size: 4" wide in lace portion, 7 1/2" long, bottom of ribbing to top of lace. Note: For rows 1 through 22 in wrist ribbing, sc in back loop only. Row 1: Sc in 2nd ch from hook, sc in each ch across, ch 1, turn. 9 sc. Rows 2 - 22: Sc in each sc across, ch 1, turn. Row 23: Bring row 1 to meet row 22, matching stitches. Sl st row 1 and row 22 together. 11 ridges made. Break yarn. Turn cuff inside out (so sl st edge is inside) and turn cuff so the ridges are running vertically, attach yarn with sl st in the side of the 1st sc in row 1. You now have 6 shell/dc combos around. Note: You can make the mitts long or shorter here. simply crochet more shell rows if you want them longer, fewer if you want them shorter. Shell rows 2 - 7: Sl st in next dc and ch sp, beg shell, (dc in next dc, shell in next shell) around, ending with dc in dc, sl st in beg. ch 3. Rows 10 - 11: Sl st in next dc and ch 1 space, beg shell, (dc in next dc, shell in next shell) around, ending with sl st in top of beginning ch 3. Fasten off, weave in ends, enjoy! I'll be posting this pattern over on Ravelry and probably sending it in to the Crochet Pattern a Day folks. If anyone has time to test this for me (after the festivities of course!) I'd appreciate it! I'm taking the next couple of days off - I'll be back on the 26th with the 1st installment of my 3rd annual Year in Review. I hope everyone has a safe holiday full of love and laughter. Very thoughtful and generous of you Bron - they're really pretty too :) Plus, I like the whole matching nail polish thing. Love the matching nail polish. Oh yes, that nail polish is gorgeous and you have beautiful nails. Have a great day everyone... until Bron comes back! Happy Holidays to yout oo-I'm taking off til the 26th also. I LOVE these! Thank you for a great pattern. If I can calm my brain from all the holiday hoo-ha, perhaps I'll be able to be one of your testers. Oh goody - the year-end review is getting closer! 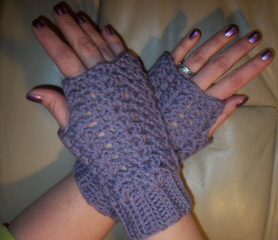 Fab mitts and great nails ! Lovely mitts. I must give them a try. Guess what just got added to my ravelry queue? I love the nail polish, too! Merry Christmas! those are darling! And crochet. I've just got to learn it, don't I? Oh these are beautiful! Wish I had seen before...lol On the list for next year! I love them! I just made them to keep my hands warm at work. The pattern seemed to work great for me! Thanks!! OH MY GOSH! This pattern is FABULOUS! Easy, fast and the mitts are GORGEOUS! It is now my all time favorite mitten pattern. I am so grateful that you graciously shared this lovely design. I have now made several pairs and sized them as needed. I found no problem in the writing of the pattern so consider them well tested by me! 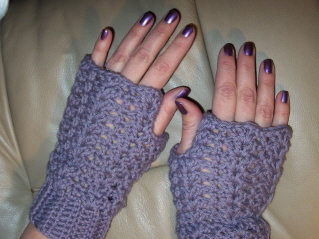 These gloves are fabulous and super simple to make, I'll post pictures of these on my ravelry account! I play poker in a real cold poker room. I made these tonight and will give them a try tomorrow. I had a bit of trouble with the thumb but I got it done. They look great! 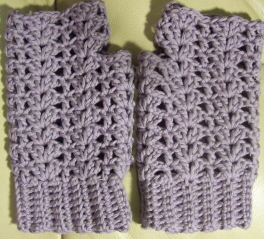 Hi, Thanks so much for this Easy Vic Shell Mitts pattern. I am excited to make these as birthday gifts. I have arthritis and can't sit at the pc to crochet. Is there a way to print this so I can actually get to make them? I started making these about 2 weeks ago. They are very easy to make.They also work up quickly. I can get a pair done in under 2 hours. Love them,great job!!! I loooove these. I am visiting my boyfriend and I only brought some of my yarn with me from home... Which is 5500 miles away :P... I am using a sport weight baby yarn... any suggestions on how to use it in such a way the gloves won't come out a weird size? What a pity I miss seeing all those gorgeous knits! Thanks for sharing the photos.